Groningen is the capital of the likewise named province of Groningen and has a population close to 200,000. The city is well known as a student city, it has over 50,000 students, which makes for a fun and busy atmosphere. Besides enjoying the many restaurants, bars and clubs there is time to relax and walk around in the Stadspark or get impressed by the beautifull Martinitoren (Martinitower). With a population slightly less than 200,000 people, it is by no means the largest city in the region, but it remains one of the most important in all of the Netherlands. While there is archeological evidence indicating settlements as far back as 3000 B.C. the actual city was founded in 950 A.D. around the site of a Roman camp. Many of the buildings still in existence today show the rich medieval history of this ancient city. By the 13th century, Groningen had become a center for trade in the area. At that time the city built a wall around its border for defense, and to enforce its position of authority in the region. Its impact was widespread, influencing many other cities in the region and causing its own dialect to become a common tongue. The height of Groningen’s influence peaked during the 15th century. During this time the famous Martinitoren tower was erected. The tower because the tallest building in Europe at the time. It was built on the site of two previous towers, both of which had been destroyed by lightning. The existing tower has weathered natural storms and numerous wars. Even today there is a bullet hole in one of the tower bells from the battle to liberate the city at the end of WWII. The University of Groningen was founded in 1614 primarily for religious studies. The city remains a center for art and culture in the Netherlands and is a popular tourist attraction. The city bears the distinction of being one of the youngest cities in the Netherlands, with the average age of its population being between 20 and 24 years of age. The city is often referred to as the Metropolis of the North, and plays an important role in the fields of art, music, business and education. In fact, it is estimated that one out of every five people in Groningen in a student. Groningen is a city full of museums. There is a comics museum, a tobacco museum and a science museum. One of the largest is the Groningen Museum. This structure is a work of art in and of itself and is known as one of the most beautiful museums in all of the Netherlands. Due to its impact and emphasis on education, Groningen is also a City of Talent, and in 2009 it was awarded as a Fair-trade town. The people who live in Groningen are generally happy and in fact were voted most satisfied with their city in a recent poll of more the 75 European cities. 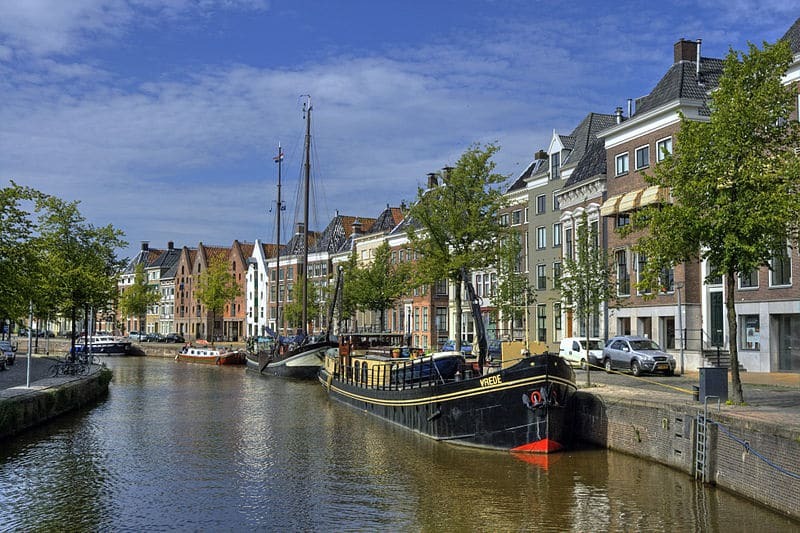 Certainly any visit to the Netherlands would not be complete without a visit to the city of Groningen. Beauty, culture, and history all combine to make this a must see city that is sure to please. Groningen is a city in the north of Holland and is also the capital of the province of Groningen. It is quite a large city with a population of just under 200,000 people. The centre of the city is surrounded by a canal called the Diepenring. This area is kept as free of traffic as possible and most of the city centre is within this area. If you are travelling by air to Groningen, there is a local airport, but it is small and it can only be reached from a very limited selection of other countries. There is a bus that connects the airport with the town. Probably the best option, if you are flying, is to get a flight to Amsterdam’s Schipol Airport. Although it is some distance away, there is a good, direct, train service that will get you to the centre of Groningen in about 2hrs30mins. If you are travelling by train from Amsterdam Centraal, then the journey is only 2hrs20mins, although there is not a direct train and you would have to change once during the journey. Driving to Groningen is not really very practical, unless you leave your car in one of the free car parks at the various Park and Ride schemes around the city. One of the most popular of these is Sontweg on the ring road in the eastern part of the city. The bus from Sontweg will get you straight into the middle of the city and cost 1,50 euro. If you do decide to drive into the city then you will find it very hard to get around and even more so to find any parking, as most of it is allocated to the local residents. Probably the best and most practical way to get around the centre of Groningen, is to hire a bicycle. This will give you great flexibility and allow you to explore areas that are not available to car drivers. There is a very good and efficient network of buses in Groningen and as most buses either go to the centre or past it, this makes getting from your hotel to your destination quite straightforward. There are good taxi services in Groningen that are available from taxi stands, or you can telephone one if you want to be picked up. Taxi Groningen, +31 50 541 8452, Taxi Centrale Groningen,+31 50 549 7676. Groningen is a large city in the northern part of the Netherlands. Despite its size it is a charming place to visit, as most of the old town has very restricted access for cars and, as a consequence, is a fairly peaceful place. Although some of the old town and most of the Market Square were bombed flat in 1945, much of the old town was left unscathed by the battles. There are many marvellous buildings to see there, from the medieval, right up to the 19th century. The universiteitsmuseum is an eclectic collection of exhibits, both temporary and permanent. The collection spans a wide range of interests, with anything from stuffed animals to old scientific paraphernalia. The temporary exhibits are usually very interesting to those who enjoy and are interested in, technology. The Groningen museum hosts a wide variety of modern art and has work from some of the biggest names in modern art in its collection. It is thought to be one of the best modern art collections in the world. The Het Noordelijk Scheepvaartmuseum, is a fascinating exhibition of the history of water transport. And for a nation so rich in its canal and maritime heritage for both inshore and offshore craft, this is not to be missed.The Grote Markt and the Vismarkt are 2 large market squares in the middle of the town and both are worth a visit and a wander around. The Herestraat is the main shopping street of Groningen and has a branch of most of the large clothing and department store that you would see in any large Dutch city. However there are plenty of smaller and possibly more interesting shops on the streets around The Grote Markt, and The Vismarkt. The most interesting of these is probably The Folkingestraat, where there are lots little artisan shops and also secondhand stores. Etcafe’t Koetshuys is a very popular cafe with Groningen locals. They do not have a set menu, but serve, one fish, one meat and one veggie course every day. It is good food at a very reasonable price. De Zevende is somewhat more classy food which is done very well but a bit more costly. Groningen is a really interesting place for those who take the time to go around it, with many alleyways and courtyard gardens making sure that there is always something new for the visitor to find.